(VOVworld) – The Justice Index is an important initiative which reflects people’s aspirations for a just and democratic society being pursued by the State of Vietnam, according to President of the Vietnamese Lawyers Association Pham Quoc Anh. The 2012 Justice Index was released Thursday in Hanoi by the Vietnam Lawyers’ Association, the Center for Community Support Development Studies, and the United Nations Development Programme (UNDP). According to Bakhodir Burkhanov, UNDP Deputy Country Director, the figure is built on the actual experience of more than 5,000 people from all walks of life in 21 provinces and cities across Vietnam. It illustrates people’s opinions and assessment of State institutions’ performance in ensuring justice and citizens’ fundamental rights. The index is a useful reference for further reforms in order to improve the legal and judicial system to meet the needs and aspirations of the people. Chỉ số Công lý là kết quả quá trình hợp tác nghiên cứu giữa Hội Luật gia Việt Nam (VLA), Trung tâm Nghiên cứu Phát triển và Hỗ trợ Cộng đồng (CECODES) thuộc Liên hiệp các Hội Khoa học Kỹ thuật Việt Nam và Chương trình Phát triển Liên hợp quốc (UNDP) từ năm 2010 cho tới nay. Các Uỷ ban Mặt trận Tổ quốc các cấp, chính quyền địa phương và người dân ở 21 tỉnh, thành phố nơi có tiến hành khảo sát đã tạo điều kiện cho công tác khảo sát thực địa. The Vietnam Lawyers’ Association (VLA), the Center for Community Support Development Studies (CECODES), with United Nations Development Programme (UNDP) released Vietnam’ s first ever empirical justice index released on October 3. The 2012 Justice Index is an important initiative which reflects people’s aspirations of a just and democratic society being pursued by the State of Vietnam, said CECODES Director Dr Dang Ngoc Dinh. The index was built on the actual experiences of more than 5,000 people from a cross-section of society living in 21 provinces and cities across the country. The index captured people’s opinions and assessment of State institutions’ performance in ensuring justice and fundamental rights for citizens. Addressing the launch, Bakhodir Burkhanov, Deputy Country Director of the United Nations for Development Programme (UNDP) in Vietnam, said the Justice Index introduces a new approach to the assessment of legal and judicial reform process. The UNDP Deputy Country Director also expressed his hope that the index could provide a useful reference for further reforms towards making the legal and judicial system more effective and responsive to the needs and aspirations of the people. The Justice Index 2012 looks into five dimensions of the administration of justice and rule of law as perceived and experienced by the people, in particular accessibility, equity, integrity, reliability and efficiency along with a guarantee of fundamental rights. Viet Nam’s first-ever justice index was released yesterday, casting light on citizens’ feelings towards the country’s judicial procedures. The findings revealed that some people have lost faith in the system due to the inefficiency of State agencies to meet legal requirements, address civil disputes and respond to administrative complaints. The Justice Index 2012 polled more than 5,000 people from a cross-section of society across 21 provinces and cities nationwide. Tellingly, one fifth of all complaints on the handling of social entitlement policy and environmental pollution prevention by state agencies revolved around the lack of feedback that citizens received from these agencies. The survey found that it often took state agencies a longer time to handle administrative complaints than permitted by law, with some cases stretching to as long as 27 months. 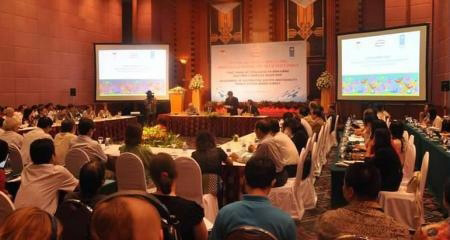 Speaking at the launch of the index findings, Bakhodir Burkhanov, United Nations Development Programme Country Director in Viet Nam, said the findings captured citizens’ true assessments of the performance of state institutions in the administration of justice and adherence to the rule of law. According to nearly half of the surveyed people, land disputes were the most common type of disagreement and a “disturbing” issue in their localities. Up to 38 per cent of land disputes are related to land use rights certificates, compensation and reallocation. Notably, four out of 10 citizens had never heard of the Constitution and of those who knew, 23 per cent were unaware that a Constitutional revision process is currently ongoing, according to the research team. Professor Pham Duy Nghia from the Economic Law Department of HCM City Economic University said that the index was important in revealing how the population manoeuvres through the complicated legal system. “We have to know how the additional 200 government resolutions released every year, along with countless other legal frameworks, can help and protect the people effectively, especially the poor and the needy,” Nghia said. The Justice Index 2012 also ranks the 21 provinces where people were interviewed, with Da Nang seen to have the most effective justice system, followed by Son La, Lang Son, Hai Duong and Long An provinces. Khanh Hoa province was ranked at the bottom of the index. Nguyen Ba Son, director of the Da Nang Department of Justice, said he hoped the index would soon be further developed and enhanced to allow provincial governments a closer look into justice areas for improvement. The index was conducted by the Viet Nam Lawyers’ Association, the Centre for Community Support Development Studies and UNDP.